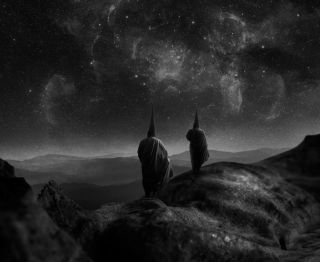 Having take black metal to the the edge of the underverse with the celebrated, axis-shifting Blut Aus Nord, French artists Vindsval and W.D. Feld are about to embark on another journey into realms where awe, nausea and reality-rupturing enlightenment combine with their new project, Yerûšelem. Ever so slightly more accessible that Blut Aus Nord, and riven with penitent, Godflesh-style industrial grooves, the band’s aptly titled debut, The Sublime, is due for release via Debemur Morti Productions on February 8, and we can bring you the event horizon right now, with a stream of the album in its full veil-parting glory. From the writhing rite of passage of the title track through the pneumatic pulses and riffs like the corona of a sick star that make up Eternal to Baleful’s mantric mangling of all known co-ordinates and beyond, The Sublime is a portal to vast reaches lurking at the frayed edges of consciousness. So if you want an inkling into what the hell that means, let go of your attachment to the mere three dimensions and enter the rarefied world of The Sublime below! And pre-order The Sublime in Europe and the US!